The rock monitor (Varanus albigularis), is a large and heavy bodied lizard found on the continent of Africa. Their bulbous, convex snouts give an angular, box-like appearance. Their forked tongues are pink or bluish and their scales are usually a mottled gray-brown with yellowish or white markings. There are three subspecies of Varanus albigularis. The white-throated monitor (V. a. albigularis), the black-throated monitor (V. a. microstictus) and the Angolan white-throated monitor (V. a. angolensis). A large (room sized) enclosure with a proper range of temperatures is provided, Varanus albigularis are active lizards and will use the given space optimally. The monitor’s room is 6 x 5 meters (20 x 16 feet). A 1.80 x 0.80 meters (6 x 2.6 feet) could accommodate a juvenile albigularis. As mentioned a room sized enclosure is best for an adult Varanus albigularis (The bigger,the better). 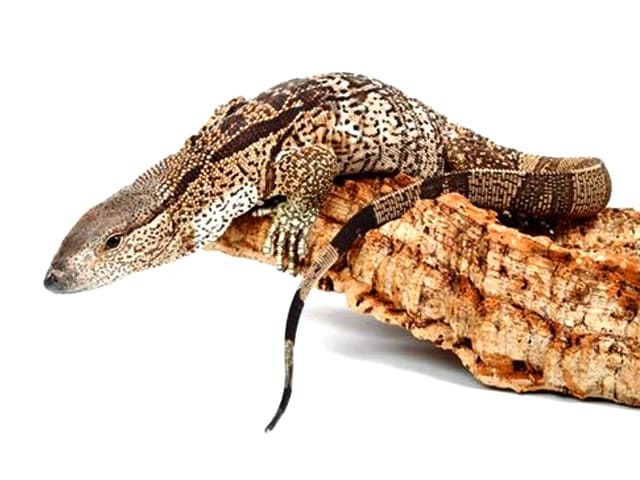 My Varanus albigularis microstictus are housed indoors in a large heated but partially insulated room (the attic).The Room contain furnishings as Large logs and branches to allow climbing, rocks to allow basking and water dishes large enough for the lizards to soak when needed. Shelters, hide spots & nesting boxes are provided in different parts of the room, mostly in the cooler areas. A mixture of sand & dirt as substrate , digging areas are provided. Lights (six 150 watt reflector bulbs and four full spectrum bulbs) are provided 12 hours per day, allowing the lizards to bask from 6 AM until 18.00 PM. Room daytime ambient temperature is 24-26 °C (75-78 °F), and basking temperatures range between 35-40 °C (95-105 °F). Night-time ambient temperature vary between 19-21 °C (66-70 °F). Fresh drinking water is provided on a daily basis.A Large water dish is provided for bathing/soaking. A water container/dish for soaking is permanently available , container is cleaned once a week (when not contaminated by feces) and as soon as the lizards defecate in the water. Feeding schedule : 5 to 6 times a week , can be on a daily basis depending on the activity level of the monitors. Overweight should not be a concern when a large (room sized) enclosure with a proper range of temperatures is provided. Monitors are active lizards and will use the given space optimally. Food Items : Mainly full grown mice, day old chicks, parakeets, rats, fish, snails from our garden(fresh & free of pesticide),the occasional boiled egg and a daily bulk of crickets (for the hatchlings and juveniles lizards) . All Monitors are fed during the morning hours and all food items are dusted twice a week with a vitamin/minerals supplement. You can handle your monitor on a daily basis in order to built the keeper/lizard relationship. There is nothing more rewarding than a stress free“ dogtame” Monitor lizard! I personally do not use gloves during handling. The room is cleaned on a daily basis(removing feces),water dishes are thoroughly cleaned once a week (when not contaminated by feces) and as soon the monitors defecate in it. Varanus albigularis will shed regularly with their skin coming off in patches. Patches of leftover shed will usually fall off on its own,eventually a water misting or warm bath can help removing the last patches of shed. Varanus Albigularis is a tough lizard and will not easily become sick as long as good hygiene, appropriate diet, proper temperatures and a stress free captive environment are provided. 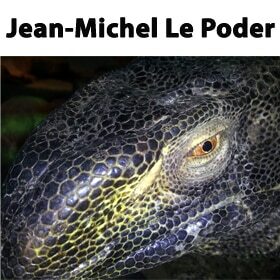 Parasites infestation(mostly in wild caught monitors lizards), roundworms and other parasites can lower a monitor’s immune system and make him more prone to illness. Maintaining a high standard of hygiene will help reduce problems with parasites. In case of any injury or illness advice from a veterinarian specialized in reptiles is recommended Varanus Albigularis are hardy lizards that can live long lives if we give them the care they deserve.